A demented serial killer dressed like a clown slaughters victims drawn to an abandoned building on Halloween night. One year after the Miles County Massacre, Monica Brown interviews the sole survivor on her television show. Following the broadcast, the facially disfigured survivor brutally murders Monica in her dressing room. On their way home from a Halloween party, Tara and Dawn have an uncomfortable encounter with Art the Clown on the street. Art follows the two friends to Deer Hills Pizzeria, where he continues to psychologically disturb Tara. Pizzeria owner Steve kicks out Art after discovering he vandalized the bathroom with feces. Art later returns to murder Steve and his cook Ramone. Tara and Dawn return to Dawn’s car to find a front tire slashed. Tara calls her sister Victoria to come get them. While waiting for her sister, Tara convinces Mike, the exterminator at an abandoned building nearby, to let her inside to use the bathroom. In the building’s garage, Tara meets a crazy woman who treats a doll as if it were her real child. Left alone in her car, Dawn hears a report on the radio about the double homicide at the pizzeria. Art gets into the passenger seat to kidnap Dawn. Art pursues Tara throughout the building, ultimately knocking her unconscious using an injection. Tara wakes gagged and bound to a chair with duct tape. Art forces Tara to watch as he saws Dawn in half while Dawn hangs upside down naked. Tara breaks free to attack Art. Art ends up executing Tara by shooting her in the face several times with a handgun. Having witnessed Tara’s murder, the crazy woman runs to Mike for help. Mike calls his brother Will before Art seemingly murders Mike in a stairwell. Looking for her doll, the crazy woman finds Art cradling it. The woman ends up comforting Art like a baby. Victoria arrives at the building to find Dawn’s butchered body. Victoria also discovers the crazy woman scalped and skinned. Wearing the crazy woman’s flesh, Art chases after Victoria. Art’s pursuit of Victoria is interrupted by Will entering the building. Art decapitates Will. Art viciously slashes Victoria. Revealed to still be alive, Mike recovers and knocks Art unconscious. Mike and Victoria flee to another room where Mike calls 911. While he and Victoria look for another exit, Art beats Mike to death. Art uses a truck to run over Victoria in the garage. Police arrive to find Art eating Victoria’s face. With two officers holding him at gunpoint, Art draws his handgun and shoots himself in the mouth. The cops realize Victoria is alive. The bodies of Mike and Art are taken to the coroner. While the coroner examines Art, lights begin flickering as paranormal activity seemingly possesses the room. Art resurrects and strangles the coroner. Victoria is released from the hospital one year later with her face horribly disfigured, revealing that she was the woman who murdered Monica Brown. Expectations influence how much enjoyment anyone can get out of a film. An individual’s mood at the time of viewing does too. So what sort of anticipatory disposition should someone have before giving “Terrifier” a go? Well, you’d better be buttoned up specifically for straight slasher movie slaughter, because the movie doesn’t have any more significant substance on hand. 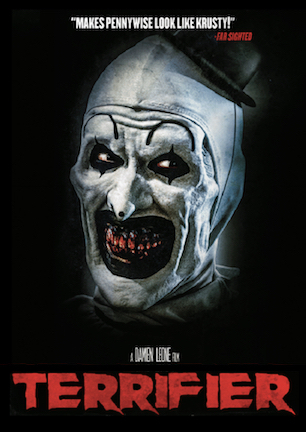 Art the Clown makes the jump from writer/director Damien Leone’s 2013 anthology “All Hallows’ Eve” (review here) to embark on a feature film killing spree in “Terrifier.” Art hasn’t shaken his short film origins though, as he finds himself employed in a simple setup fighting to fill a full-length frame against natural instincts. There isn’t a whole lot of story to summarize. Two friends run afoul of Art on their way home from a Halloween party and end up as mice to his cat in an abandoned old building. Various other victims arrive one at a time to go under Art’s blade as well, which is essentially all there is to it. For a short while, the film can hook viewers on its lo-fi grindhouse vibe of unashamedly gritty gore. If nothing else, Leone takes his throwback tone to unrated extremes ripped right from the VHS era. Copious carnage features crushing, stabbing, slashing, splitting, sawing, and that’s just when it comes to heads. Leone saves his most creative kill for a wishbone sequence rivaling “Bone Tomahawk’s” (review here) in terms of squirm-inducing gruesomeness. Some of the slayings look silly. Other effects look terrific, like an unsettlingly grotesque makeup job on the disfigured woman who opens the movie. Whether individual instances work or not, there is certainly no shortage of murderous mayhem. A questionable taste factor comes into play on more than one occasion. “Terrifier” sidesteps some of those criticisms by virtue of having pretty tight practical FX for a small flick made with very few zeros in its bankbook. By and large, “Terrifier” is better lit, shot, and edited than most microbudget movies of its ilk. I might be better able to appreciate its down and dirty simplicity if there were beefier steak to go along with its limited sizzle. “Terrifier’s” goal to provide a pure exploitation era bloodbath can only motivate a certain number of minutes, and that number is not 84. If an editor pared down the film to include only scenes with dialogue, I’m not sure there would be more than ten minutes of content. Staying engaged thus comes down to how much you want to watch a Final Girl limp from one long hide-and-seek sequence to an even longer hide-and-seek sequence. Trading one leading lady for another at the midpoint further highlights how pointless the pincushions, I mean protagonists are. The thin script exists merely to move bodies between rooms as cheats to get another kill onscreen while simultaneously extending the runtime with redundancy. Acting from the cast of unfamiliar names gets the basic job done. I wouldn’t single out any particular performance for praise in a traditional sense, although everyone at least embodies an actual character who does more than robotically recite dull lines. They read as real enough people by average standards for fright film fodder. Art the Clown has a recognizable look, and a pinch of personality played up by pantomiming. But his characteristic silence, distinct lack of backstory, and singular focus on homicide doesn’t allow any deeper dimension. He is certainly no Freddy, Pinhead, or even Leatherface. Art is largely left to languish as a slasher with a unique appearance, yet few other identifiers to really remember him by. An admirable technical effort on the cinematography and staging side of things earns the film a few points. The movie is splattery, but not sloppy. Ultimately however, if you’re not getting on board “Terrifier” for the visual violence of its blood-soaked brutality, there’s no reason to take its unnecessarily extended trip at all. March 19, 2018 by Ian Sedensky.